Canning tomatoes is an excellent way to preserve them to use after the season is over. Canned tomatoes save money. Whether you grow your own or purchase a bushel at the farmer’s market, preserving tomatoes costs less than buying them at the store. Canned tomatoes taste good. Fresh tomatoes preserved just after they’re picked from the home garden taste much better than processed tomatoes. Canned tomatoes are convenient. A stocked pantry shelf provides an ongoing food supply. There are two types of canners most commonly used in processing tomatoes from the home garden. Water bath canner. A water bath canner is a deep, tightly covered metal pot with a rack or basket in the bottom. The canner is deep enough to hold quart jars plus an inch or two of water to cover them and a couple of excess inches above that for boiling water. Filled jars are placed in the canner. Water is brought to a boil over jars to process tomatoes. Pressure canner. A pressure canner is a heavy pot with metal flanges on both the top pot rim and lid rim (for a tight seal), a pressure vent on the lid, and a pressure gauge. The pressure canner’s rack sits in its interior bottom and holds filled jars sitting in 2-3 inches of water. The lid flanges are lined up with canner flanges and turned to create a tight seal. When heated, the water becomes steam. Pressure builds. The vent is closed, sealing the pot. Steam expands, making both pressure and temperature rise to process tomatoes. Use only canning jars that are specified for home canning. They are made with heat-tempered glass and can withstand high temperatures in a hot water bath or pressure canner. In other words, do not try to can tomatoes with recycled mayonnaise jars or other consumer jars. Seal canning jars with canning lids, sometimes called dome lids. Canning lids are held into place by ring screws. Lids are lined with rubber to make a perfect seal with the jar top. Canning lids withstand one use. Do not re-use canning lids from year to year. You can re-use canning jars and rings over and over. Check canning jars for cracks and chips. Discard damaged jars. 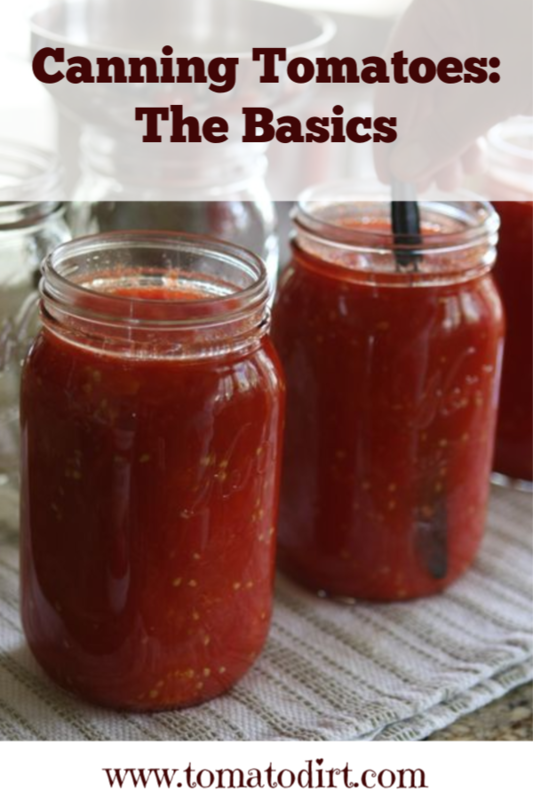 To prevent contamination, sterilize canning jars before filling with tomatoes. Wash them in hot, soapy water. Rinse jars with boiling water, place them in canner in boiling water for 5 minutes, or place in pressure canner and sterilize them in steam for 5 minutes. For best results, keep jars hot until packing tomatoes. To prepare canning lids and rings, place them in a saucepan covered with water. Bring water to a boil. Cover pan and keep lids hot until jars are packed. Select firm, fresh tomatoes. Wash them well. If you wish to remove tomato skin, with a knife, cut an X on the bottom of the tomato, just deep enough to penetrate the skin. Drop tomato into boiling water. Blanch for 20-30 seconds. Use a slotted spoon to remove tomato from boiling water. Immerse tomato in ice water. Use knife to remove tomato core. Skin will slip off. Leave tomatoes whole or quarter them. Remove seeds if desired. Use a tomato press to save time and work, eliminate chopping, and reduce waste. Place prepared tomatoes in heavy pot and bring them to a boil before ladling into jars. 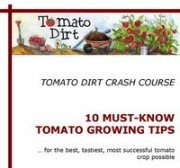 There are two ways to prepare tomatoes for canning. Cold pack. Unheated tomatoes are packed into jars and then processed. Cold pack processing is no longer recommended by the USDA because of health risks. Hot pack. Tomatoes are cooked before being packed in jars. Hot pack is the recommended processing method. Place prepared tomatoes in a large pot and bring them to a boil in their own juice, stirring constantly. Boil for 5 minutes. Use ladle with wide-mouthed funnel, measuring cup, or mug to pour hot tomatoes into hot jars. Leave ½” space at the top of jars. Add ½ teaspoon salt to each jar. Run a knife or spatula around the inside of the jar to release air bubbles. Wipe rim of jar with clean, damp paper towel. Place jar lid on rim. Screw on ring firmly. Place prepared jars in a water bath canner or a pressure canner and process. Fill water bath canner about 1/3 deep with hot water. Place rack or basket in the elevated position. Place jars in rack. Make sure jars don’t touch each other. Lower rack into canner. Place lid on canner. Bring water to a boil. Add boiling water from teakettle or pot so that jars are covered by an inch or two. Place lid on canner. Allow water to gently boil while tomatoes are processed. Allow water to boil (“process”) over jars of tomatoes for 35 minutes (pints) or 45 minutes (quarts). Turn off heat. Move the canner off burner. With tongs, remove jars from the canner and place them on a heat-resistant counter or cooling rack. Place rack in the pressure canner. Fill pressure canner with at least 2 quarts of boiling water. Set hot, filled tomato jars on rack in pressure canner. Place cover on pressure canner. Close and lock. Leave vent open. Turn heat to high. Watch for steam to come from vent. Allow vent to steam for 10 minutes, then place stopper on vent. Leave heat on high until pressure gauge registers 5 pounds. Reduce heat enough to maintain 5 pounds of pressure. Process tomato pints and quarts for 10 minutes at 5 pounds. Turn off heat. Remove pressure canner from burner. Allow pressure gauge to return to zero (without opening vent). Open vent and allow canner to cool for 2-3 minutes. Remove cover. Lift cover away from you to protect yourself from steam. Use tongs to remove jars from the canner and place them on a heat-resistant counter or cooling rack. Set jars upright on cooling rack or thick towel in a draft-free area. Allow enough room in between jars so they can cool. Test seals by pressing down the center of lids. If centers are firm or concave (or if you heard them pop), lids are sealed. If centers give, lids didn’t seal. You can reprocess unsealed jars, refrigerate them, or use them immediately. If you wish, you may remove canning rings and reuse them to can other jars. Store jars upright in dry, cool area.